Gadbad Ice cream is a famous dessert of Karnataka. As I read in Wiki, its the signature dish of a ice cream parlour based at Mangalore. Me and my Hubby both are big fans of Gadbad Ice cream. Every time we visit our native place Sirsi, we will visit the ice cream parlour at least 2 - 3 times just to enjoy Gadbad Ice cream! Layers of chopped fruits, ice cream jelly, dry fruits and nuts make this ice cream delicious and rich in taste. 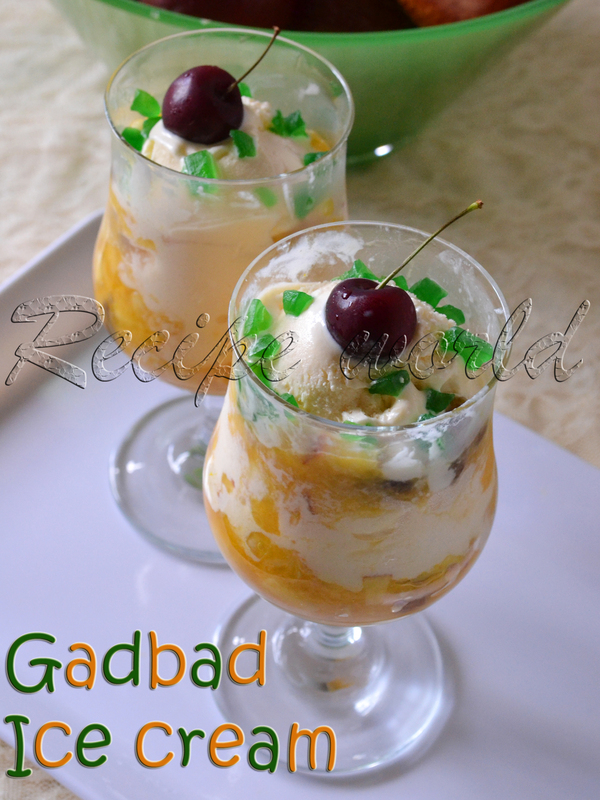 I love to prepare Gadbad Ice cream at home when I have ripened mangoes in my pantry. Try this delicious ice cream and let me know your feedback! Chop apple, mango and banana finely. Combine them in a mixing bowl. Add around 2 tbsp of sugar or according to taste. Mix it well and keep in the refrigerator for an hour. Meanwhile, dry roast the broken cashews into golden brown and keep aside. Take 2 serving glasses. Add one layer of chopped fresh fruits in both the glasses. Top it with raisins and cashews. You can also add tutti frutti. Add around 2 tbsp of ice cream on its top. Repeat these layers again one or two times as per your wish. After you add the final layer of ice cream, garnish it with raisins, cashews and tutti frutti. Top it with cherry and serve immediately. 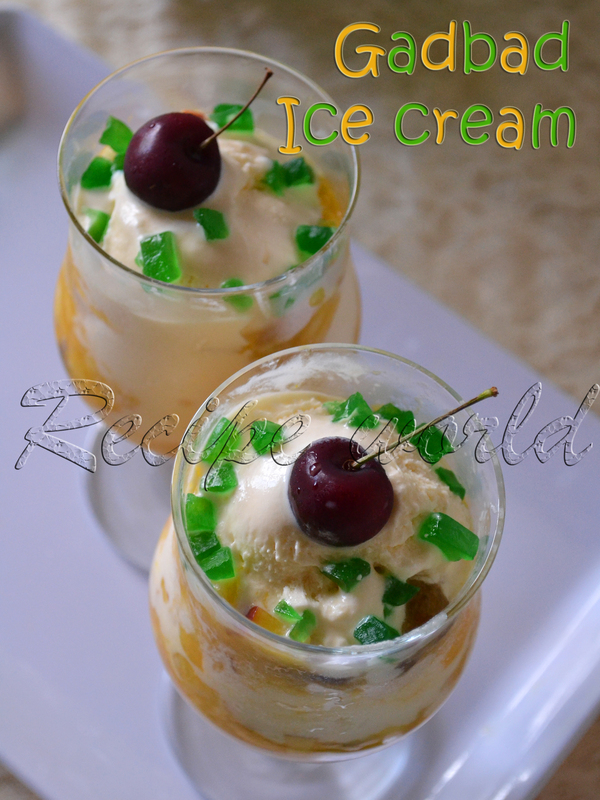 Orange, sapota (chikkoo) and pineapple fruits also go well for this ice cream. 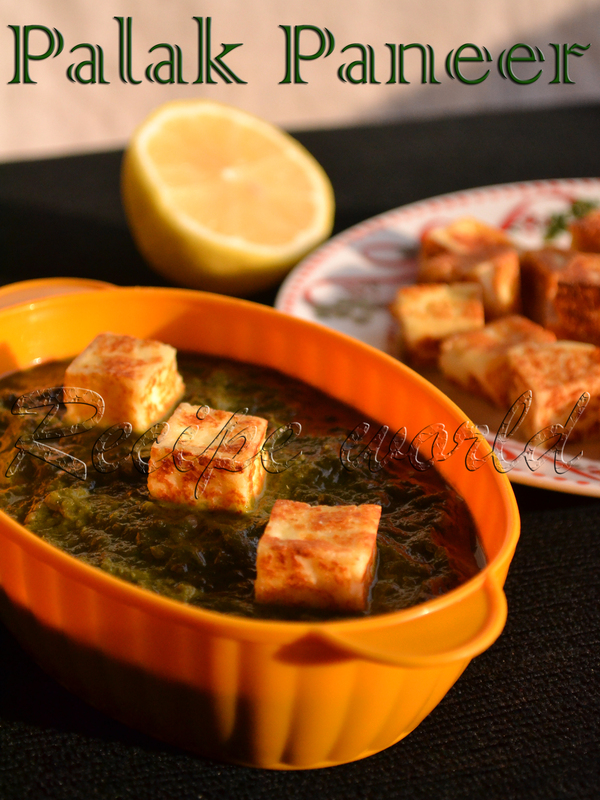 Fruits which I have mentioned in the recipe are not compulsory; You can try it with your favorite combo of fruits. You can add different flavors of ice cream for each layer to make it rich and more colorful. 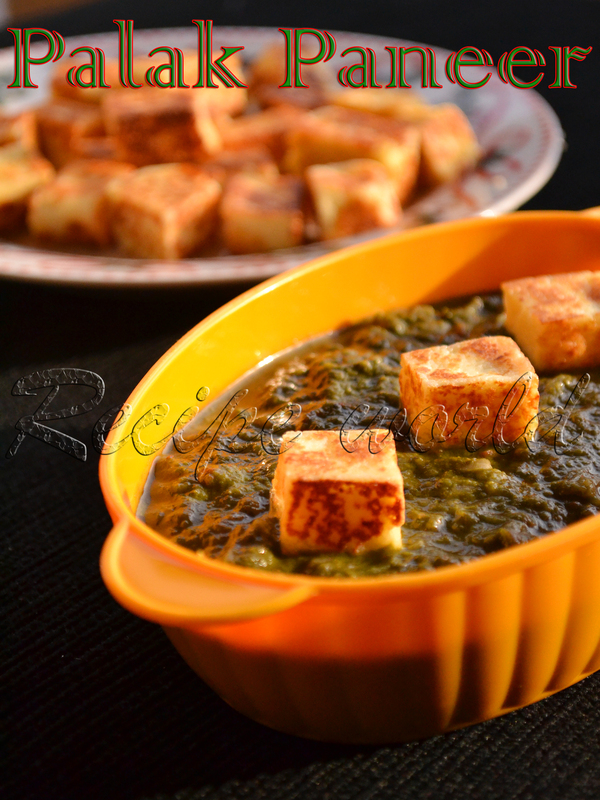 Different kinds of leafy vegetables are part of our healthy diet. They are good source of various nutrients and taste delicious as well. One among those leaves is Amaranth Leaves. We buy it often from the vegetable market. Amaranth leaves are a good source of calcium, iron and vitamins. 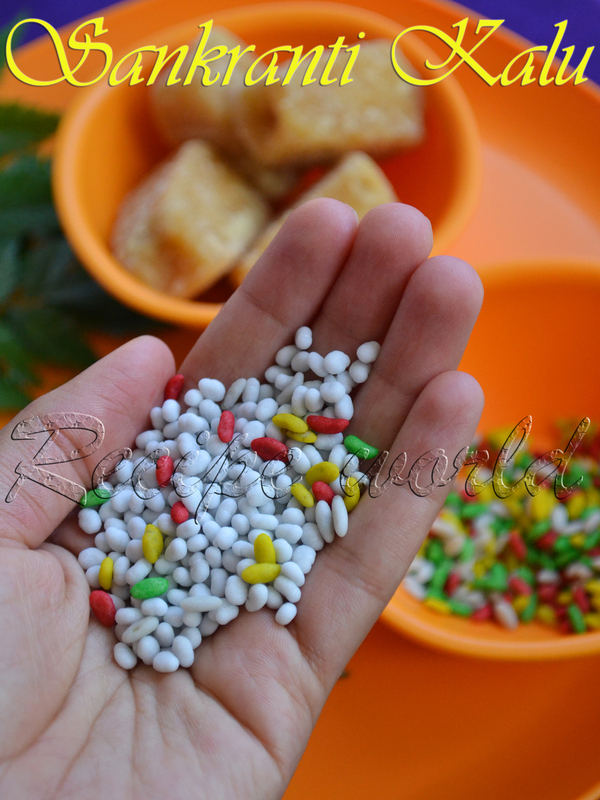 They are good for preparing stir fry, sambar, hashi, saasive and other side dishes. 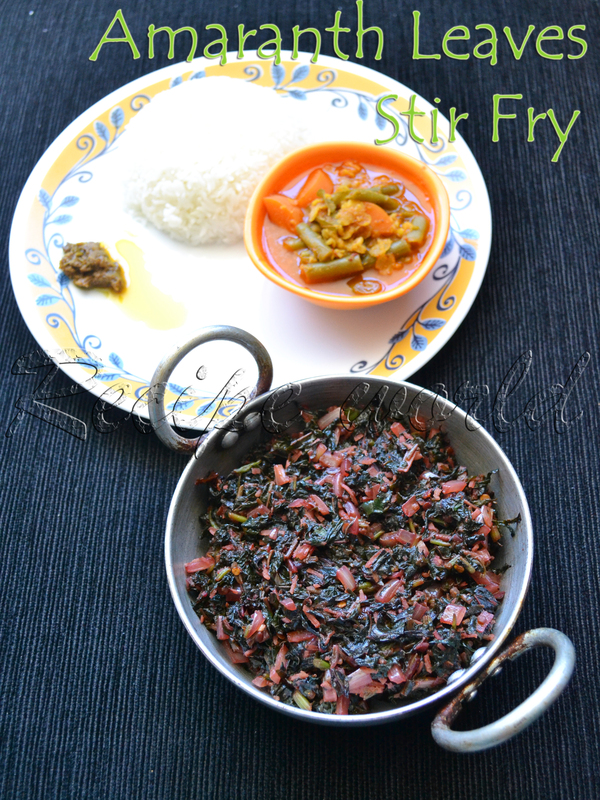 Below is the recipe of Amaranth Leaves Stir Fry / Harive Soppina Palya..
Wash the amaranth leaves in clean water thoroughly. Chop them finely. Include the tender stems also while chopping. Heat the oil a heavy bottom pan. Add broken red chillies, urid dal and roast them for a minute. 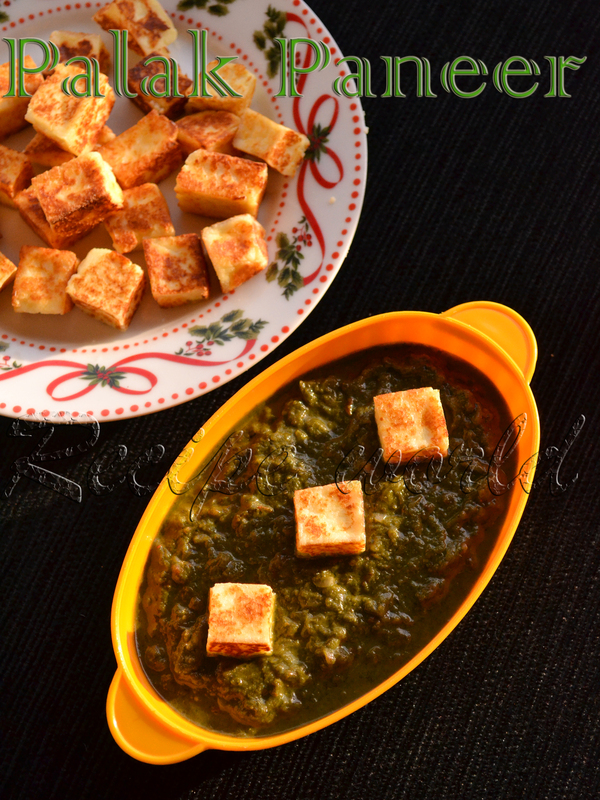 When the urid dal turns into light brown color, add mustard seeds and asafoetida. When the mustard seeds start crackling, add the turmeric powder and saute it once. Now add the chopped amaranth leaves and mix it well. Quickly find the broken red chillies in them which are crunchy after frying, powder them coarsely using your fingers or with the help of laddle. Add the powdered chillied back to the seasoned mixture. Cover the lid and allow the mixture to cook on medium flame. No need to add any water, since the water content in the leaves will be enough for cooking them. Stir the mixture regularly. 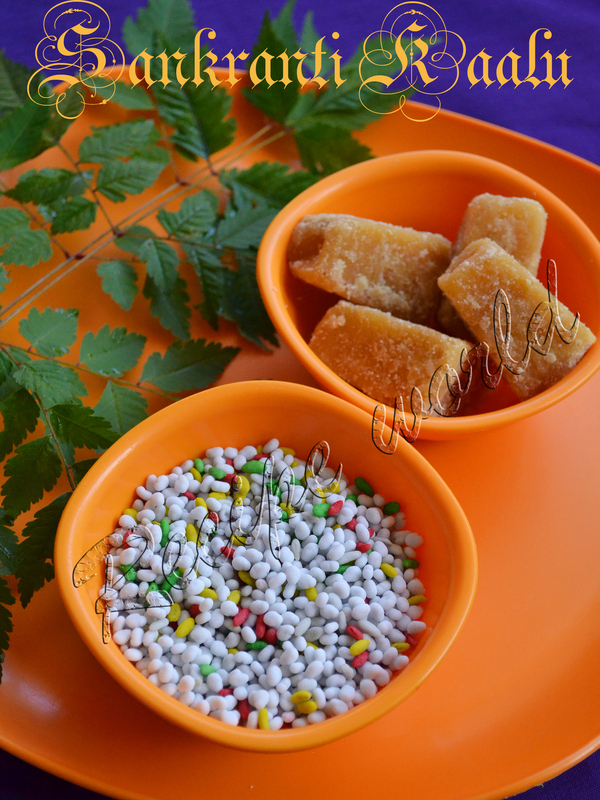 Once the leaves are almost cooked, add salt, amchur powder and jaggery / sugar for taste. Add grated coconut after 2 - 3 minutes. Also add the chopped onion, if using. I have added onion here. Cook it for 5 more minutes and turn off the flame. 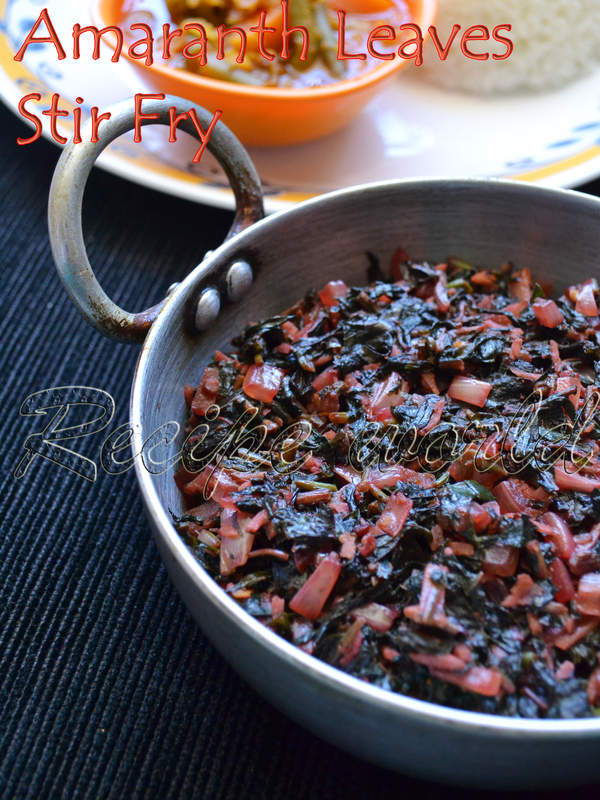 This stir fry tastes delicious with rice, chapathi or poori. Add only 1/4 tsp of jaggery / sugar for this stir fry if you don't want to make it sweet. If you like sweet taste, add more jaggery / sugar according to taste. And if making it sweet in taste, don't add onion. Chips are perfect snacks for tea time! Varieties of chips can be prepared using different vegetables. At my native place, people prepare chips using vegetables like raw banana (plantain) chips, raw jack fruit chips, bread fruit chips, sweet potato chips, etc. 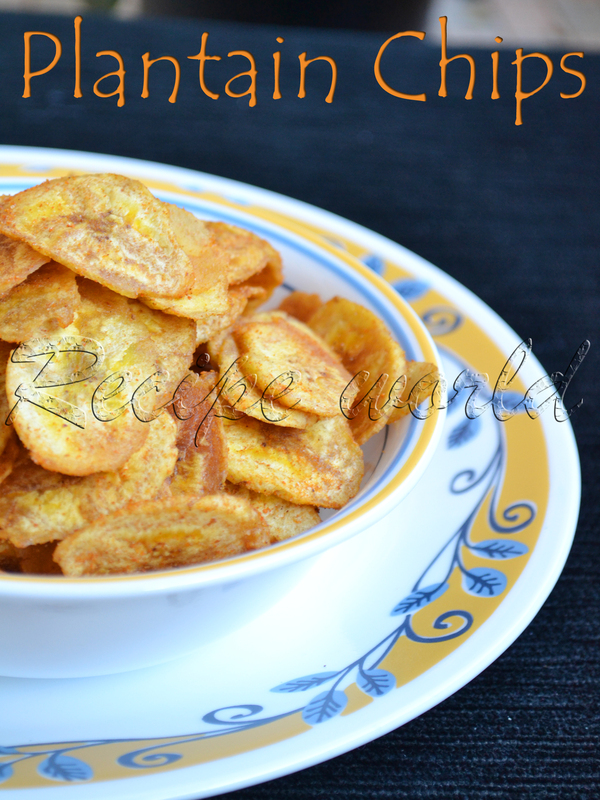 Raw banana (plantain)s are available in all the seasons and hence, one can prepare Raw Banana Chips anytime. There are different varieties of bananas, the one known as 'Nendra Baale' is one among them, which is perfect for preparing chips. Both me and my hubby like varieties of chips prepared at our native place. Since it has been a while we visited native, sometimes we miss the native style food here. Whenever I find raw banana (cooking banana)s in Indian stores, I remember those crunchy and tasty chips prepared at my native. One fine day, I prepared chips using those cooking bananas which were there in the pantry. I came out nice and after adding my mom's style masala powder, it tasted the same like the native one. After this trial, I'm happy that I can prepare my favorite Banana Chips anytime! Here is the recipe of Raw Banana Chips / Plantain Chips..
Take around 5 cups of water in a wide vessel and add 4 - 5 drops of cooking oil. Peel the raw bananas and keep them in this water. Take the peeled bananas one - by - one, rub them in a dry cloth, chop them into thin slices. Heat oil in a heavy bottom pan. Deep fry the sliced bananas on medium flame till crispy and/or golden brown. Spread the fried chips on a tissue paper for a minute or to in order to absorb the excess oil. Transfer the chips to a wide bowl. Add Masala powder and salt, as required. Toss it nicely and ensure that masala powder and salt is coated evenly. Enjoy the crispy crunchy chips with a cup of Tea or Coffee! If preserved in an airtight container, chips will remain fresh for at least upto a month. Instead of Masala powder, you can add turmeric powder and hing (asafoetida) for flavoring. 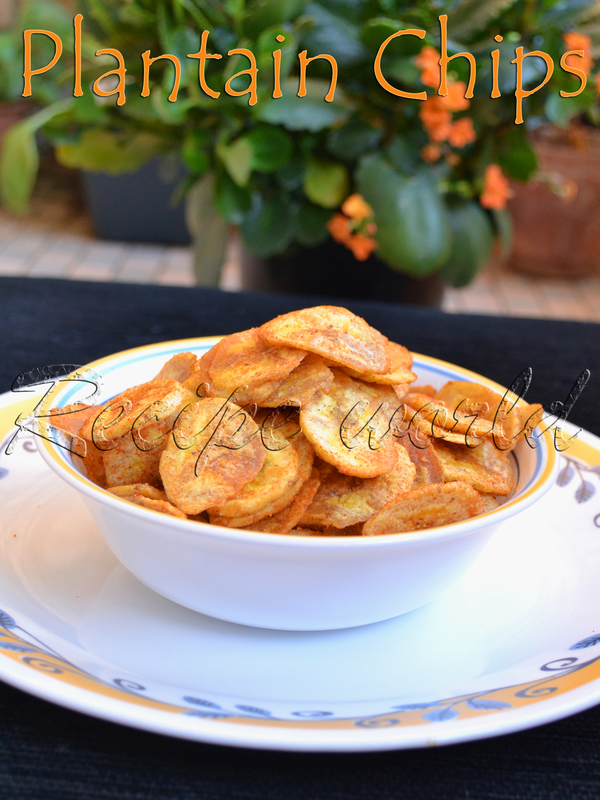 Sunflower oil and coconut oil are good for frying raw banana chips. Soaking the peeled bananas in water is to avoid them from ripening. If you are using the peeled bananas quickly, then no need to soak in water.